The share of Ontario workers toiling for minimum wage has more than doubled from 4.3 per cent to 9 per cent since 2003, according to new research being released Tuesday. And those $10.25-per-hour workers are more likely to be women, visible minorities and immigrants, says the study by the Wellesley Institute. The research, based on Statistics Canada data from 2003 to 2011, shows that young workers are more likely to be earning minimum wage. But almost 40 per cent, or 183,000 of them, are 25 or older, the study shows. Another one million workers, most of whom are 25 or older, earn slightly above minimum wage at between $10.25 and $14.25. Since greater shares of recent immigrants, visible minorities and women work for minimum wage in Ontario, an increase would also help close those wage gaps, she said. s feel their budgets are constrained, minimum wage policy is something that can address income inequality,” Block told the Star. Until the Liberals were elected in 2003, Ontario’s minimum wage was stuck at $6.85 an hour for eight years. Between 2004 and 2010, they raised it to $10.25 an hour, but it has been frozen ever since. Last summer, the Wynne government appointed a panel to study how best to set future minimum wage increases. Anti-poverty groups, however, are calling for an immediate raise to $14, a rate they say would allow a single person working full-time to live about 10 per cent above Ontario’s poverty line. 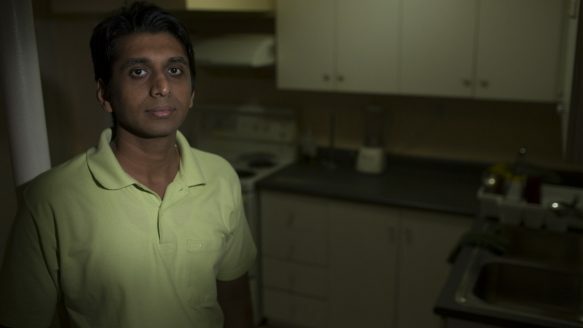 Computer technician Ankit Aggarwal, 26, has worked a string of minimum and low-wage jobs since coming to Toronto from India in 2010. Although his pay as a cashier at a downtown corner store increased to $10.90 an hour in April, it is “hard to save any money,” he said. In June, Aggarwal found a second job paying $11 an hour refurbishing old computers. But he was laid off last week. “It is very hard to find work in my field,” said Aggarwal, who has a bachelor’s degree in computer studies and a master’s in business administration from India. Even with a diploma in computer applications from Centennial College, he says most companies won’t hire trained immigrants unless they have two years of Canadian experience. It hasn’t been any easier for Doreen Clarke, 51, who came to Canada from Barbados 23 years ago. The personal support worker quit her $13-an-hour job earlier this year because she wasn’t getting enough hours. As a group, women, visible minorities and immigrants such as Clarke are almost 50 per cent more likely to be working for minimum wage than the general population: 13 per cent versus 9 per cent, according to the study. Meantime, recent immigrants like Aggarwal are more than twice as likely to hold minimum wage jobs at 19 per cent, the study says. Last week, Premier Kathleen Wynne played down the chances that the minimum wage would be raised to $14 an hour. She said small businesses couldn’t afford the hike. “The worst thing we could do is to raise minimum wage to a point where we actually lose jobs, and that is the fear of business and, quite frankly, our government,” Wynne said in Simcoe, Ont., on Friday. Activists remain undeterred. On Friday, members of ACORN (Association of Community Organizations for Reform Now) will invite Wynne to join them for a pre-Thanksgiving turkey burger lunch in mock appreciation of her refusal to raise the minimum wage. On Saturday, the Worker’s Action Centre is staging a “feast for fairness” around a formal Thanksgiving dinner table outside the St. Lawrence farmers market. They are calling for a $14 minimum wage that takes in farm workers, who are currently exempted from Ontario’s minimum wage laws.